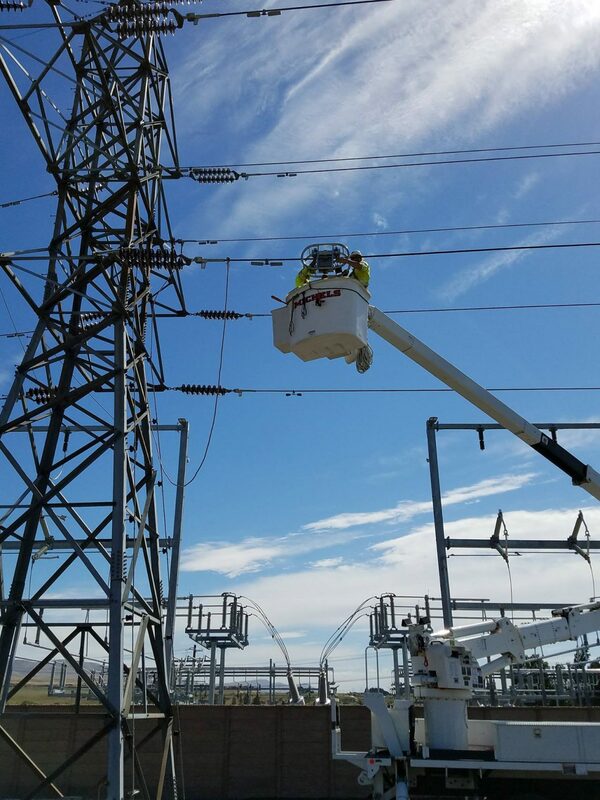 Since delivering its first kilowatt-hour of electricity in 1949, Northern Wasco County People’s Utility District (NWCPUD) in The Dalles, Oregon, has held reliability and affordability as its two core tenets. As a small-town utility in the hydro-centric Pacific Northwest, and a customer of the Bonneville Power Administration, those values historically were pretty easy to demonstrate. Today, those same values and many more exist. We work to protect the safety of our personnel and infrastructure, reduce the environmental impacts associated with providing electric service, meet new and evolving regulatory requirements, and integrate new, supply-side resources such as wind and solar. These imperatives have required us to look at business differently than in years ago, and it has required an evolving management approach for our small utility. Most of the major transmission and distribution infrastructure is at, or near, the end of its life, and planning is in progress for renewal (Figure 1). The challenge has been to find the optimal balance between renewal and system expansion opportunities. Unlike many other regional utilities, NWCPUD is expanding with a new data center, crypto-currency, light specialty manufacturing, high load-factor agriculture, and other business and residential service loads. Our first major undertaking was to derive a longer-term capital investment plan for the PUD’s various business units (Figure 2). Asset management categories of asset age, asset health maintenance history, operational performance, current use, and any known changes in future use were considered. 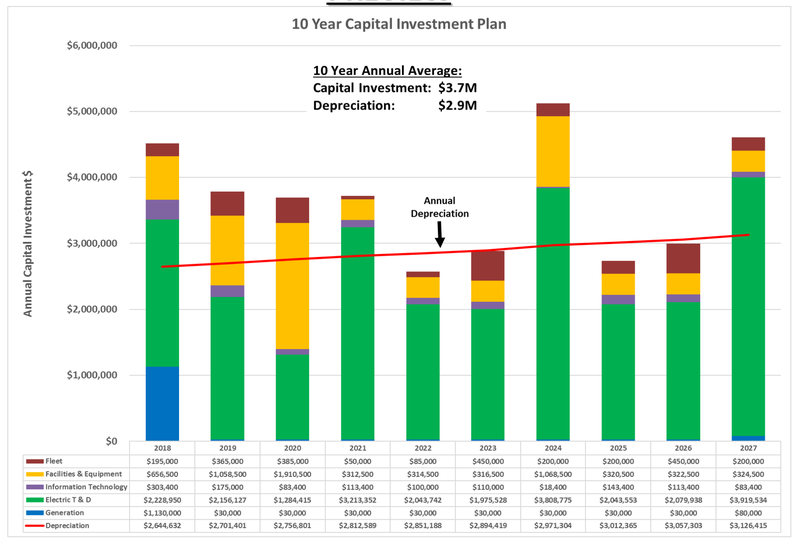 After gaining a better understanding of the PUD’s priorities, a long-term financial plan was developed to identify the associated revenues that future investments in improvements would need to generate. We also considered potential rate changes that might be needed for the organization. One major ground rule from the PUD’s publicly elected governing board of directors was to keep electric rates as low as possible. That meant tempering infrastructure renewal risk and system expansion risk, with financial key performance indicator (KPI) risk on a year-by-year basis. Rates, debt service coverage, days cash on hand, and other metrics were identified early in this strategic process. Similarly, a load, resource and energy model (along with many other attributes) was needed to best discern the business climate and system needs. While these are not new or novel ideas in the energy sector, their consideration and utilization were needed at NWCPUD during this process. The planning and subsequent discussion informed the utility that it would be most prudent to acquire municipal bonds and construct its first new substation in well over a decade. The new RiverTrail substation would help reduce specific system constraints, while generating revenues through new customer connections. After the RiverTrail substation was completed, the utility turned to other needed renewal projects. One such project was a functional reset and expanded utilization of the organization’s enterprise resource management system. This system contains the financial accounting and customer resource information systems, as well as associated engineering and asset data. The organization was not using the system to its fullest, nor was it fully realizing the benefits of having a complete enterprise system. Electronic timesheets, payroll and accounts payable were the first small “wins” that the project team accomplished for the organization. Plus, these improvements had high impact and high visibility. There are many additional aspects to this project and it isn’t yet completed, but it is likely the most important project we’ve undertaken since it deals directly with both customers and staff. Speaking of staff, as modernization of the utility has occurred, opportunities for employees to learn new skills and succeed on a professional and personal level have been created. Participation in various WEI programs, such as Business Analytics, the Operations Conference and the Western Region Mutual Assistance Group (WRMAG), continue to be beneficial for our employees as they learn and grow. The utility is completing many other infrastructure and technology projects as it moves through years one and two of its current plan. The most interesting project may be the automated meter infrastructure (AMI) project currently being evaluated. The opportunity to help our customers better understand their energy use — perhaps even partner with them to incorporate their smart-home devices with utility operations — is exciting for the future of our organization and community. We’re not exactly sure what that could look like, but we’re hopeful for many possible futures. The recent journey of NWCPUD is not unique. Like any enterprise, it can only be successful because of the people associated with it. Our staff has worked diligently and tirelessly to embrace the changes necessary to modernize this small-town utility. Customer and operational expectations continue to evolve and it is our intention to ensure that NWCPUD is ready to be their energy supplier of choice now and into the future. Roger Kline is Northern Wasco County People’s Utility District’s general manager. 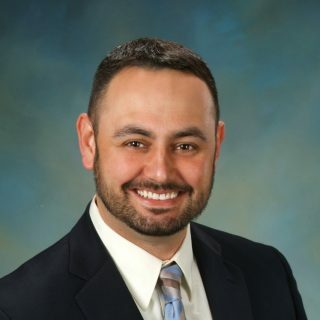 He leads a 50-employee, vertically integrated utility that provides electric power services to approximately 15,000 people in The Dalles metropolitan area and parts of the surrounding region. The Dalles is the county seat for Wasco County in the Columbia Gorge region of Oregon.